Ecosystem decision support systems allow land managers to use the power of GIS to support their decision making process. Many of the applications below use the FVS (Forest Vegetation Simulator) software system developed by the Forest Service for predicting future forest growth. Camp Lejeune Ecosystem Management Model, The Sanborn Map Company, Inc. This project involved software development and maintenance for an ecosystem management model using ArcMap, SQL Server, SDE, and VB.NET. The application predicts future land conditions based on user specified management strategies. Future conditions are reported in a variety of formats including text, graphs, maps, and pictures. Tools have been created that allow the user to interactively specify the management strategy for a particular management unit. The application integrates Forest Vegetation Simulator (FVS) to predict future forest conditions based on management actions. A tool within the application analyzes and rates forest stands for Red Cockaded Woodpecker habitat suitability. Stands are analyzed within a buffer distance surrounding known nesting colonies of this endangered species. Contiguous habitat areas are calculated based on a minimum distance between stands with suitable habitat. Kingbird Software provided software development services for this project. Pennsylvania EIMS (Enterprise Information Management System), The Sanborn Map Company, Inc. Assisted development of a forestry management system using SDE, MS SQL Server, and VB.NET technologies. Ken Bunzel worked on this project while employed by Sanborn Map Company. Based on the Camp Lejeune Ecosystem model, Ken Bunzel created another ecosystem model that includes forest management constraint analysis and uses FRAGSTATS to quantify landscape structure. This application also includes query, reporting and mapping tools. The growth and yield model used to simulate growth and management of forest stands is FVS (Forest Vegetation Simulator), a standard used by the U.S. Forest Service. The application is being written for ArcView 8 (Visual Basic with ArcObjects). Ken Bunzel worked on this project while employed by Space Imaging Solutions. 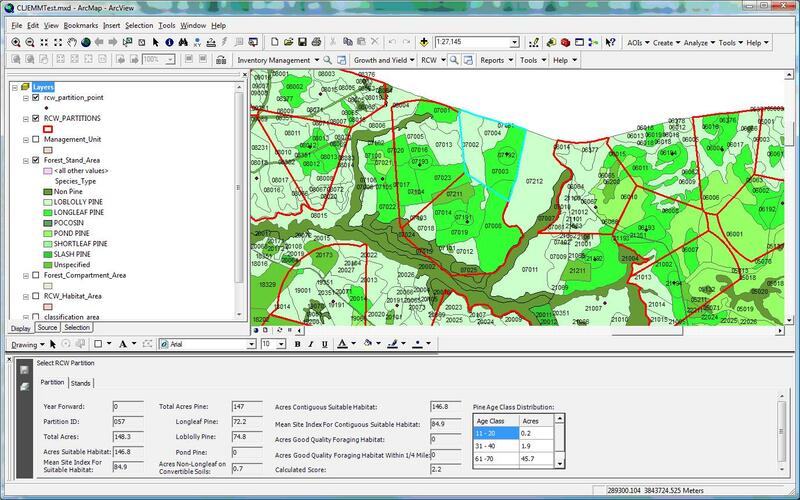 Worked as part of a team to build forest management system for Bowater Inc. The multi-user system uses SDE and Microsoft SQL Server and is written for ArcView 8. This system incorporates custom query, reporting, and mapping tools as well as standard block maps. Ken Bunzel worked on this project while employed by Space Imaging Solutions. Worked on a team to implement an ecosystem model using ArcView and Avenue scripts. This model predicts future land conditions based on user specified management strategies. Future conditions are reported in a variety of formats including text, graphs, maps, pictures, and 3D views. Avenue scripts were written that allow the user to specify future management scenarios and display/describe future conditions using text, graphs, maps, and pictures. The interface has been developed using custom dialogs. Tools were created that allow the user to interactively specify the management strategy for a particular polygon by clicking on a view and selecting from a list of appropriate management strategies. The user can then select from several reports that depict future conditions using graphs. Ken Bunzel worked on this project while employed by Pacific Meridian Resources. This is an ArcView 3.x extension that allows linking to FRAGSTATS software. FRAGSTATS is spatial pattern analysis software used for quantifying landscape structure. The extension will run FRAGSTATS for a given GIS layer, and then join the FRAGSTATS output to the layer. The user can choose any of the output fields for classifying the data in the map. Ken Bunzel developed this software while employed by Pacific Meridian Resources.